On Thursday, May 31, at the Viva Films’ headquarters in Ortigas Center, the five feet and seven-inch tall Miss International 2016, Kylie Fausto Verzosa was recently introduced as the new female face of Thai Royale Spa. Verzosa was already eyed by the owners to be the next face of the brand even right after the beauty queen was crowned Miss International. It took them quite a while to wait, but finally she made her commitment to endorse this massage business that was started by the husband-and-wife entrepreneurs. Like anyone else, the Baguio beauty-turned-actress and now a Viva talent; she believes that frequent visits to Spa do create both mental and physical health benefits. Based on studies getting regular massage in spas like Thai Royale Spa—directly correlates with better quality sleep, fewer sick days, reduced absenteeism from work and fewer hospitalizations. Today, the massage business has grown to 70 branches and still counting. It is a proud member of Wellness Organization Worldwide (WOW) and one of the few that is certified by The Union of Thai Traditional Medicine Society (International Body Work Training Center) in Bangkok, Thailand. It offers a variety of massage services and body treatments. Clients are treated to a luxurious massage at an affordable rate and with great ambiance at the same time. Massages like Thai, Swedish and even Back and Foot are just among the services available in each of its branch. Treatments like Body Scrub Salt Glow, Microdermabrasion Diamond Peel and Facial+Diamond Peel are also being offered. For more information, log on to its official website or like its facebook page and follow its IG and twitter accounts. 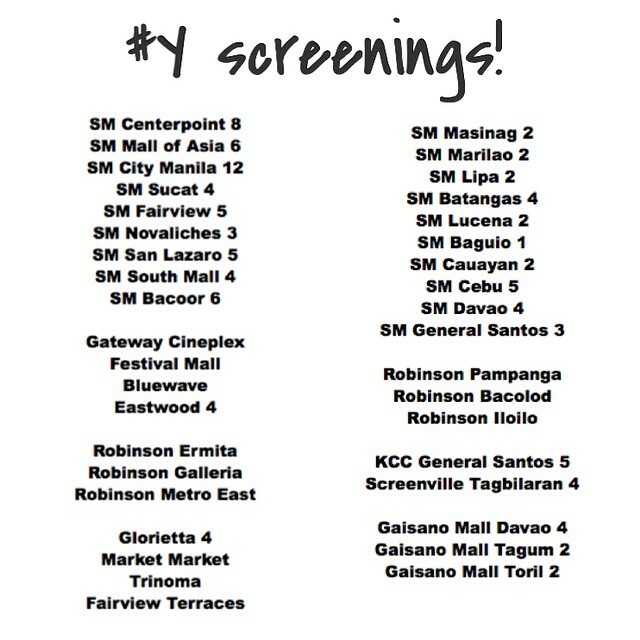 ‘#Y’: The Modern-Day Retelling of 80s ‘Bagets’? On December 10, as part of Star Cinema’s 20th anniversary celebration, it will release and distribute the youth-oriented, but not-too-pleasant-themed flick of young filmmaker Gino M. Santos’s ‘#Y’. Gino Santos is seen talking with the press, along with his two lead stars Elmo Magalona and Coleen Garcia. Photograph courtesy of Stanley Briz. The film revolves around the lives of upper-class and modern-day youth and features young stars like Elmo Magalona, Coleen Garcia, Sophie Albert, Kit Thompson, Slater Young, and Chynna Ortaleza. Gino M. Santos, one of the youngest commercial, TV, and film directors in the country who graduated with a Digital Filmmaking degree from De La Salle – College of Saint Benilde in 2008 was chosen as Philippines’ delegate for the Motion Picture Association Conference held in Beijing, China. He is best identified with flicks that focus on youth particularly set in present-day. With ‘#Y’, together with his screenwriter Jeff Stelton, this is their second attempt to present the lives of today’s youth. In fact, according to Santos, “I intend to make a trilogy about the kids of today, following them in high school which was the setting for ‘The Animals’ and ‘#Y’, which depicts their lives in college. Two of Santos’s films are reminiscent of the 1984 two-part Philippine youth-oriented comedy films ‘Bagets’ created by Viva Films about a group of high school teenagers. In this successful 80s movie, it was Jake Tordesillas who wrote the story and the multi-awarded Maryo J. Delos Reyes was the one who directed it. Back in this year’s Cinemalaya, ‘#Y’ competed in the New Breed category and was given the Special Jury Citation for Best Acting Ensemble for its cast. The film conveys a message of how today’s generation live their lives that is greatly influenced and unified by social media and the Internet. It also promotes the ideological lifestyle of ‘YOLO’ which means ‘you only live once’ which simply implies ‘make the most of what one has in this lifetime. ‘#Y’ is written by, and is produced by Stained Glass Productions and Timeframe Media Production. For more details and updates on the film, like its facebook page.